The 9U Pro Player Hurricanes teamed up with hundreds of volunteers and the Rotary Club of Woodstock to package Christmas gifts for families in need on Wednesday night December 18th, 2013. By the end of the night nearly 1200 bags of toys had been packaged and tagged for delivery. We were a small part in this huge effort to make this Christmas special for so many. We would like to thank the Rotary Club of Woodstock for their service and providing us this opportuntiy to make a difference. Merry Christmas! 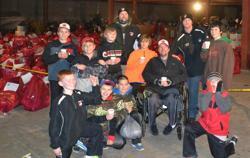 The 10U Pro Canes had a very successful food drive November 3, 2013 at the McHenry Jewell Osco. The boys gave a great team effort and were able to collect a whole 24 foot trailer full of food and $233 for Thanksgiving dinners. Fish currently assists over 600 families per month and will distribute 645 holiday boxes for Thanksgiving. Donation Thank you Letter from McHenry F.I.S.H. 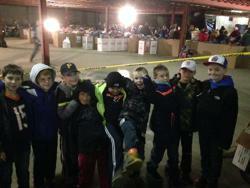 The 11U Pro Player Canes helped fill presents bags for the Woodstock Christmas Clearing House. The Woodstock Christmas Clearing House is a (501)(c)(3) non-profit organization that was started in 1970 by the Woodstock Girl Scouts, taken over in 1972 by the The Rotary club of Woodstock. They provide food, gloves,presents and mittens to families in need. Last year they served over 1,100 families and 240 seniors. The Pro Player Canes organization takes pride in volunteering time in the communities around the McHenry County area. This is a good way to have our players exposed to the people that are part of this community as well as strengthen the individuals and communites that we are all part of. The 12U Pro Player Canes will work with the First United Methodist Church in Crystal Lake on March 2, 2014 to provide a hot meal for those less fortunate. The church serves about 40 meals every Sunday. The team will assist in preparation of the meal, serving the meal and cleanup efforts needed. This effort goes a long way for the players, as well as the recipients and the team in which the Organization is proud to be a part of the PITCH program. The 14U PITCH Project to gather gently used baseball equipment for Roberto’s Kids is underway. There is a box (or two) next to the entrance door of the Hurricane Academy to collect any donations but please no junk equipment. Kindly pass this information along and spread the word amongst your teams. ©2019 Pro-Player Hurricanes / SportsEngine. All Rights Reserved.